Rex Marine carries popular sizes of strut bushings for most recreational flat and vee bottom runabout, lake, river, and drag boats. The Aqua Lube or Ryer Tex type bushings are made of fiber with flutes machined in. All of our strut bushings are water lubricated. 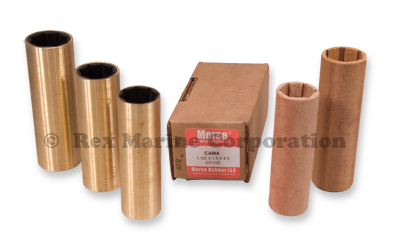 We also carry the Morse Rubber line of marine bearings which feature naval brass outer casings with high density rubber inners. They are very durable and the standard of the industry especially in larger boats.